Curiosity classes were started 3 years ago by caring mom of 2 curious kids with the main goal to teach children how the science plays in their daily lives! These classes would be a platform for little scientists to keep the thinking cap on and be inquisitive as to why somethings happen and how! 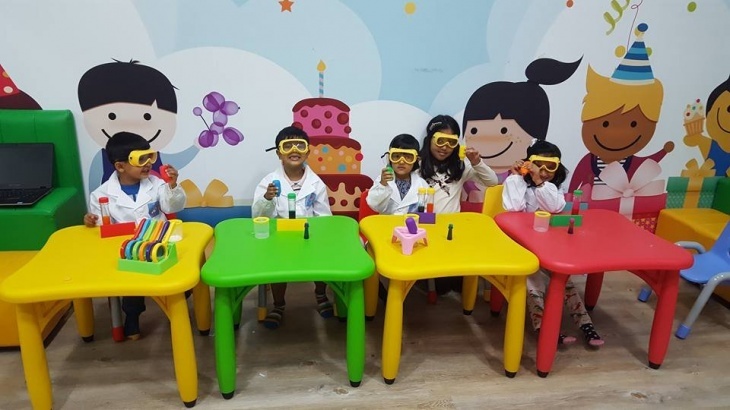 Children would learn and explore scientific principles through various hands on experiments, games, discussing, analyzing recordings and understanding practical application of the scientific principle around us! This group is designed to introduce little minds to science by various interesting activities, hands on experiments. This class lays the foundation for kids to learn/explore concepts of science. This class is accompanied. It's amazing to see the little minds intrigued by concepts of science. This group encourages children to observe and explore science in depth. Children perform hands on experiments to increase their understanding of science and its concepts. Children are encouraged to discuss their observations and share their findings with other classmates. This group works and expands kids' learning on what they have learnt in the previous group. This group is encouraged to predict outcomes of experiments and how and where do they think these scientific principles come to play in their lives. Classes held at various locations across Hong Kong ie.